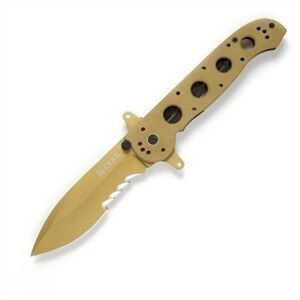 Knife maker Kit Carson designed CRKT's M21-14DSFG Desert Big Dog for Special Forces use in desert warfare. A blade coating of titanium nitride and handle scales of G-10 give the knife its desert brown hue. Beneath the sand-brown exterior, the knife is all metal with frame and liners of stainless steel and a blade of high carbon stainless 8Cr14MoV steel alloy. The G-10 scales add texture to the grip without adding much weight and also provide good insulation for the hands when the steel in the knife is too hot or too cold to handle. The 3.875-inch spear-point blade includes two "Carson flippers" at the base. The flippers form a functional hilt when the blade opens and provide opening and closing leverage. Start the blade moving with the thumb studs, and finish the swing with the flipper. The Auto-Lawks mechanism automatically fixes the blade in a locked-open position -- the knife can't close until the Auto-Lawks is pulled back and the liner lock is pushed to the side. The unusual Veff Serration on the cutting edge is so good that it's patented. The hook-style teeth grip anything that passes over them. Tough straps and cords won't skip past it. When open, this is a full-sized, 9-1/4-inch-long knife strong enough for prying as well as cutting. Folded, the knife is only five inches long and mounts to pockets or harnesses with four different positions of the stainless steel pocket clip. Mounting the knife tip-up in the pocket isn't recommended, but the other options provide useful choices for both right- and left-handed users. Skeletonizing the handle frame reduces the weight of this folder to only 5.5 ounces but leaves the knife open to dust and grit. Give the Big Dog a good cleaning regularly to keep it working properly. See the CRM16-14SF for a dark tactical version of the Kit Carson folder with an aluminum handle frame.